Serbs in north Kosovo rejected ethnic Albanian rule Wednesday in a controversial referendum seen as a slap in the face to efforts by Serbia and the EU to resolve differences over the territory. Many Kosovo Serbs fear that Belgrade, which is hoping to win official EU candidate status in March, will eventually give up its claim to Kosovo, leaving them at the mercy of the ethnic Albanian government. As expected, the results of the vote showed almost 100-percent rejection of the authority of the Kosovo government, but it has no legal weight and has been dismissed by both Belgrade and Pristina as well as the international community. "After the referendum, it will be crystal clear to ethnic Albanians, the international community and politicians from Belgrade that it is not (just) local politicians who do not want the Kosovo institutions, but that it is the wish of the whole Serb community living in the north," Krstimir Pantic, mayor of the Serb part of ethnically divided flashpoint Kosovska Mitrovica, told AFP. The referendum, which asked voters if they accept Pristina institutions, was held ahead of the fourth anniversary on Friday of Kosovo's unilateral declaration of independence from Serbia in 2008, a move rejected by Belgrade. 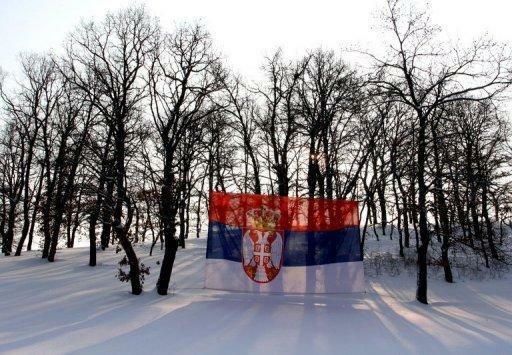 Many Kosovo Serbs feel Belgrade should not deal with a government it officially does not recognise. But only Serbs in northern Kosovo, which make up just a third of the Serb population of the territory, took part in the vote, which was also held on Tuesday. "Out of those who voted, 99.74 percent answered 'no' to the referendum question" if they accept Pristina institutions, Ljubomir Radovic, a spokesman of the referendum commission told reporters after all the votes were counted. 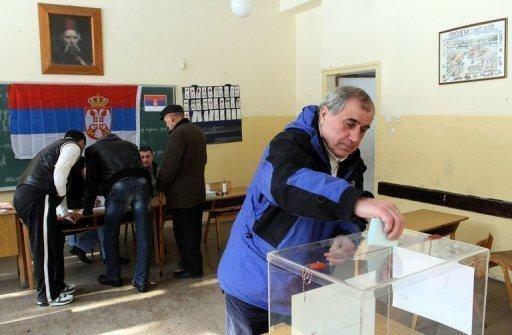 In all four Serb-dominated municipalities in northern Kosovo, where 75 percent of voters cast ballots out of the 35,500 eligible to vote, only "69 votes were with marked 'yes'," Radovic said. The vote has been dismissed by the international community as little more than an opinion poll that could damage prospects for more EU-sponsored talks between Belgrade and Pristina. Serbia's state secretary for Kosovo, Oliver Ivanovic, on Tuesday lashed out at what he branded the "open defiance" of the Serb-dominated northern Kosovo municipalities in organising the vote. Serbian President Boris Tadic said the vote was "harming the interests of the state", while insisting Belgrade would never accept Kosovo's independence, which is recognised by countries including the US and most of Europe. In Pristina, the Kosovo parliament passed a motion declaring the referendum "invalid." The parliament said it "finds that the so-called referendum organised by the illegal structures does not produce any legally and politically binding effect and as such is not valid". Albania's foreign ministry also expressed its "concern", saying the vote would not contribute to the dialogue between Serbia and Kosovo. Out of a population of about two million, there are some 120,000 ethnic Serbs in Kosovo, with 40,000 in the north on the border with Serbia and the rest in enclaves dotted around the territory. Kosovan analysts said the referendum demonstrated that Kosovo prime minister Hashim Thaci's government does not control the whole of its territory. "This referendum reconfirms for the umpteenth time that Kosovo cannot establish control over all its territory," commentator Adrian Collaku told the independent Zeri daily, calling it "another step towards secession" for northern Kosovo. The north was the scene of unrest in November, when some 50 soldiers from the NATO-led KFOR peacekeeping force were hurt in a dispute between the two sides over control of border crossings.